After once again searching for pen and paper to make a note while on the phone, I decided to be proactive and made myself an adorable desk organizer. I was able to use up some of my favorite paper scraps which made me feel even more virtuous. Here's to starting 2013 organized! Using a ruler, measure and mark your paper to make five 4" x 4" squares. With scissors (or cutting board), cut the papers to size. 2. Glue papers into place. 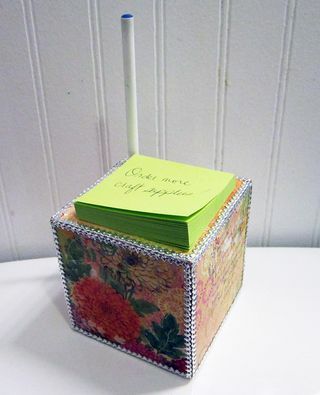 Using the sponge brush, spread Mod Podge across one side of the cube. Center and place paper. With your fingers, smooth out any wrinkle or air bubbles. Repeat this procedure on five sides of the cube. Allow to dry and then paint a layer of Modge Podge over the surface of the paper. Allow to dry. Cut a 12" piece of Dresden paper trim. Apply a line of glue to the outer edge of one cube face. Center and place the trim, carefully bending it to follow the corners. Repeat this procedure on the papered sides of the cube. Allow to dry. Measure and cut a 4"x4" square of craft cut. Glue to the bottom of the cube. Allow do try. Apply double-sided sticky tape to the back of your small pad of paper. Center and attach to the top of the cube. Determine where you want your pen to be in relation to your pad of paper. Mark the spot with a pencil. Use a screwdriver to start a hole in the Smoothfoam™ cube. Use the end of your pen to finish up the hole. Variation: Collage with photos sent by family and friends over the winter holidays.